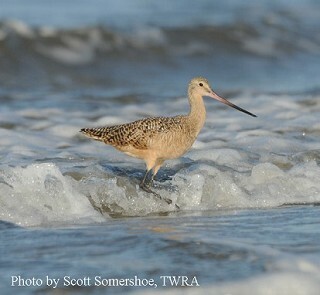 A large and heavily built godwit, with a long, slightly upturned, bi-color bill and rich brown overall coloring, the Marbled Godwit, breeds inland in northern wetlands and prairies and winters along the coasts. Marbled Godwits are social, nesting in semi-colonial groups with no real territorial boundaries. They are a fall and early spring migrant in Tennessee, often found walking and probing the mudflats near shallow pools and ponds. Description: Marbled godwits have a long, slightly upturned creamy pink bill with dark tip, long bluish-gray legs, rich buff-brown color over all, cinnamon wing linings, and cinnamon stripe in wing and finely barred across the chest. Chest is buffy and plain in winter. Hudsonian Godwit – In breeding plumage, heavily barred, reddish chestnut underparts. black tail with white stripe on the base, white rump, long, pointed slightly upturned light pink bill with black tip. In winter plain gray back and neck and whitish underparts. Long-billed Curlew – Larger in size, long decurved bill, indistinct eye line, buffy underparts, cinnamon, heavily marked brown flight feathers and dull blue-gray legs. Long-billed Curlew is exceptionally rare in Tennessee (less than 5 records) and is not likely to be found. Habitat: In Tennessee, Marbled Godwit can occasionally be found in cultivated fields, marshes, mudflats, transients pools of water. Diet: Insects, crabs, worms, aquatic plant tubers, small fish, leeches and small mollusks. Status in Tennessee: Marbled Godwit are uncommon migrants in fall and early spring. Females are longer-billed than males yet only slightly larger in other measurements. The Marbled Godwit gets its name from its call. Best places to see in Tennessee: Rankin WMA, Duck River Unit- Tennessee NWR, Reelfoot Lake area.